You are currently browsing the Laurie Klein Art — Laurie's Place blog archives for February, 2010. “Character Building”, both figurative and literal. On one hand we have the illustrator going through their own creative mental process (welllll… i do, not everyone is as angst-prone as i am i suspect), but also, from the art standpoint it’s a lot like Dr. Frankenstein (a bit of this, a bit of that, stitch it all together, add a lightening strike) with some Darwinian evolution thrown in. It starts as a scribble… but it grows and evolves, and eventually winds up becoming a real, finished character. “Fur & Feathers” had several featured characters that needed to be developed, mostly animals (something of my speciality), but also a little girl, named Sophia. The minute i read the story i wanted Sophia to look like my daughter. Let’s face it, there is something of an autobiographical streak in all creative work. I suspect, when she wrote it, Janet Halfmann was picturing someone from her own life – a relative perhaps, or maybe herself as a little girl. The wonderful thing about “art” – any art – is that it allows the creator (and the audience too of course) to transport themselves. To be part of the action or the experience. The writer does it a bit more metaphorically, with words which by their very nature are more abstract and ethereal – interpretive. The illustrator gets to give it a more concrete, tangible form . Such is the give and take, the ebb and flow, the yin and yang, the I-have-the-pencil-and-I-know-how-to-use-it nature of the visual arts. And it does wind up kind of excluding the author. This came up at a book talk recently, when a writer said that she preferred to self-publish – so she could work directly with the illustrator and have a stronger say in how her story, her characters, were portrayed. Fair point. That is certainly a legitimate concern and all i can liken it to is when someone writes a screenplay and sells it to a movie studio. Unless that person is going to produce and direct the movie themselves (as well as finance the dream cast, build the sets, sew the costumes, and cater lunch) they kind of have have to trust the people who do that for a living. When it comes to stories, the writer has to trust the publisher to pick the best illustrator for the project. 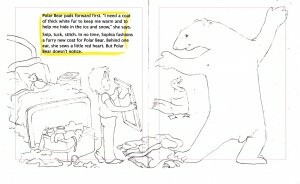 An illustrator whose skill, style, and technique the publisher feels will best compliment the author’s words and bring the story to life. Maybe even take it to places the author never considered. In the case of “Fur & Feathers” i think Sylvan Dell went out on a limb, just a little bit, with me because this story was something of a departure from my other books. There were animals to be sure, but there was also a human character that had to be sustained throughout 13 full-page spreads. And the setting was all interior, the little girl’s room, as opposed to the more natural settings i’d illustrated in the past. Now i do draw people, and have many in my portfolio, a lot of them children, but a one-off, spot illustration is different from a sustained character in a series of drawings. I knew i could do it (oh, okay… i thought i could do it) and i gave Sylvan Dell several samples of my children sketches, per their request, to demonstrate i was up for the challenge, but it was still an incredible vote of confidence and faith on their part to let me run with the story. But all that artist ego-bolstering aside, the fact remained that in terms of “Fur & Feathers” i really wanted Sophia to look like my daughter… my quintessential Muse… but my “little girl” had long since grown up and was no longer the age of the child in the story. In fact, all the kids in my neighborhood, who i had long turned to for children poses, had outgrown the age of the child in the story. I had photo albums, and lots of other kid references, and of course my imagination, so for the initial first stab at the pencil sketches i just kind of “roughed” in the pose. 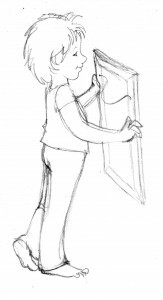 More of a place saving generic kid figure, to give a general idea of what the eventual finished character should be doing, per the manuscript – but without all the features and details that would make Sophia “real”. At this stage it really didn’t have to look specifically like my daughter, or “anyone” for that matter … it just had to give the basic idea of what the character was going to be doing in the picture. All the pictures. Details would come later. It does help to have an actual reference. A real person or a photo to look at. Again, i am just speaking for myself, but i am reminded of something one of my professors said in college. It was a painting class, and i was doing a still life of bottles and twigs, but i was making it up entirely in my head. My professor came around, and noting the lack of real, physical items suggested i go out and actually gather the objects i was trying to paint. He said the human mind was not nearly creative enough (and i’m paraphrasing here, because it’s been ages since the class) to recreate all the nuances and details, effects and shadows, found in nature. In rather stereotypic cocky college-kid fashion i thought my professor was bonkers. My imagination was more than creative enough, thank you very much… but, big surprise, my professor turned out to be right. It really does make the job so much easier when you have good references. Of course that being said, i need to confess i never did have a specific consistent reference model for Sophia. She was kind of an amalgam of pictures of my daughter, other kid tear sheet references, and photos of the young girl who lived down the street (who was the right age and very happy to pose for me so i could get Sophia’s body correct). Since i was going for a more whimsical style i felt i had a degree of leeway with Sophia’s over-all appearance, and just kept fine-tuning the pencil sketches using what references i had available to work with. 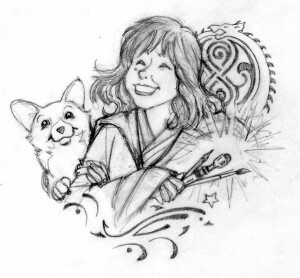 In retrospect i kind of made that part of the job harder on myself than was necessary because i agonized and second guessed myself the entire time i was drawing Sophia – worrying she didn’t look consistent from one illustration to the next. But even if i the perfect child model had been readily available, and at my beck and call whenever i needed a quick pose, it was still up to me to decide exactly WHAT this fictional child would look like. Long hair or short. Pig-tails or curls. Black hair or brown. Freckles? Glasses? So many decisions. I did all the preliminary rough sketches giving Sophia a kind of short-ish bob hair style (a bit mussed since she’d been sleeping) and that just became her look. It wasn’t a particularly conscious decision beyond the fact that i didn’t want her to look too “girly” so the book could appeal to boys as well as girls. I read somewhere that girls generally have no problem reading books with boy protagonist, but boys tend to shy away from books with girls as the leading character, so Sophia needed to be broad-based enough appeal to all readers. And heck – it didn’t hurt that she looked a lot like my daughter did at that age (what are the odds!?). And besides being responsible for the hair and make-up (so to speak) the illustrator also has to serve as the costume designer. If the clothing details are not described in the manuscript it is up to the illustrator to figure out what the character needs to wear. Obviously period stories need time period appropriate attire, modern stories – particularly those that take place predominantly in a child’s dream – give you a lot more flexibility. Since F&F starts out with Sophia in bed, and the story continues through the rest of the night, it was pretty obvious that pajamas would be the clothing of choice, but that still offered a broad range of options. Night gowns, footie PJs, over-sized T-shirts, gym shorts and a tank top – all sorts of possibilities were considered and discarded. Though actually, in the case of F&F, i didn’t consider and discard that many options. I had a pretty clear idea of what Sophia would sleep in right from the start. Being a current, modern, story (as opposed to a period piece) and based on what my own daughter used to wear (and what i like to lounge around in) i immediately thought of traditional pajama bottom pants and a related short-sleeved T-shirt ensemble. I confirmed this couturial choice with my Sophia/Jesse model down the street but i must confess i was also influenced by the pajamas that the 10th Doctor wore in the “Doctor Who” episode, “The Christmas Invasion” and wanted to give a little visual nod in that direction. That was probably one of the first, of what would wind up being several, little personal pictorial inclusions (not counting Sophia’s whole appearance to begin with) throughout the book, but those will all be explained and examined in their due course. For the time being Sophia was more or less figured out. Now it was time to turn my attention to the featured animal characters….. 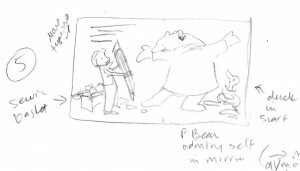 I got the contract and deadline information for “Fur & Feathers” in April (2009) – the important due dates: Sketches – July 20 (these would be the Pencil Roughs). Cover art (camera/scanner ready) – August 15. Final art (or finished color) – December 2o. Lots of time to get everything done… except, drawing 13 line illustrations for a children’s picture book was not the only thing on my To Do List. It never is. I can’t speak for other Graphic and Commercial Artists or Illustrators but for me life often feels like a continuous three-ring circus, multi-tasking, juggling act. Constantly working on one project while i wait for approvals on another, or paint to dry, or reference information to come in. A client meeting here. A design proposal there. Rough sketches for Project A this day. Finished art for Assignment B the next. While thumbnail sketches were technically not a required step in the F&F illustration process as far as Sylvan Dell was concerned i had to do them anyway – for myself – before i could ever start working on the pencil roughs so those had to be factored into the schedule as well, along with all the other art projects i already had on the calendar. Projects with more pressing, or at least equally pressing, deadlines. Two large posters depicting the various layers (and what lives there) of the Rainforest and the Ocean, and a five-wall mural for a local elementary school were the most immediate concerns. I juggled thumbnail sketches with the finished color work on the posters through May and got the thumbnails mailed out on June 3rd; then i turned my attention to the details of the school murals, my first large-scale public painting project – a series of 5 walls – i was going to start painting the day after school closed for the summer on June 11. I’d already come up with the rough sketches for the walls and figured it would take about a month (a week per wall – give or take) – of steady work – to complete, so the first week of June was filled with school meetings and preliminary drawing and reference work. 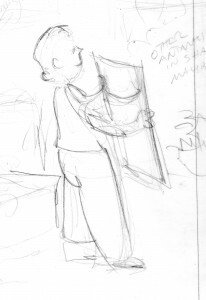 On Sunday, June 7 i suddenly had my first panic attack, realizing i had to have finished F&F rough pencil sketches in Sylvan Dell’s hands by July 20… about the time i figured i’d just be wrapping up the murals. Talk about suddenly being in a cold sweat! Of course after the initial hysteria i remembered i would have every Friday, Saturday and Sunday free, because the school did not want me working in the building on those days, so i reassured myself that i could paint during the week and dedicated every weekend, from June until mid-July, to the F&F pencil roughs until those were finished. Fortunately a good portion of the “heavy lifting” had already been done through the thumbnail sketch process so that simplified things significantly (and i’ll use the drawings for Page 5 as an example of the steps, with additional descriptions supplied by my journal entries written during that period). 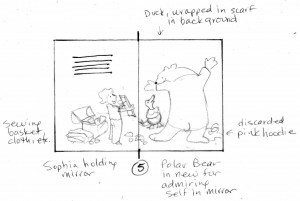 The illustration where Sophia “re-furs” the polar bear was one of those that didn’t change significantly from 1st rough thumbnail to finished color. I hit on the bear’s “Ta Da” pose, with Sophia holding a mirror, almost instantly and never wavered (they don’t all come that easily). Calendar Juggling Note – The J A Crookhank Elementary School murals began on Thursday, June 11. The weekend of the 13th – 14th was spent finishing up the Rainforest & Ocean poster art. Rest of the week was spent painting. SUNDAY, JUNE 28 – “Took a few notes for the book.” That’s the only note written concerning F&F but i know what it means – reference hunting. I do a lot of reference hunting (which i shall describe in more – excruciating – detail in another entry). Calendar Juggling Note – Continued daily mural painting during the week (finish wall #3, start on wall #4). At this stage i mark out the full size book and indicate the “live area” as well as the word placement (supplied by Sylvan Del). I always have leeway to change where the type falls, but i generally just work within the limits Sylvan Dell has set. This is the stage where i really get to see if my thumbnail sketches fit the format. It’s also frequently the stage where i suffer my first, of potentially several, self-doubt and confidence issues. Part of the problem, i realized, was i needed better references poses, specifically for the little girl, to achieve stronger image placement and visual interest. 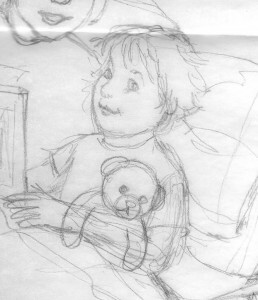 The first round of sketches were kind of static and basic, just to block out the characters, but now i needed to start adding detail (like facial features, Sophia’s hair, her pajamas, etc) and more interesting positions. In the past i had an easy, instant child model in the form of my daughter (my Creative Muse and Partner in Crime) but she had long since grown up, not to mention was away at college, so i was kind of winging things using old pictures from the photo albums (of which there are currently 44). I was also simultaneously trying to establish the look of the main animal characters and their poses. And don’t even get me started on the background issues (backgrounds are not my strong suit, so are basically ignored for as long as physically possible). Calendar Juggling Note – Finished wall #4 on the 8th and came up with a great idea for the 5th – and LAST wall! Also this week – went to Orlando to paint a life-size leatherback sea turtle statue. Calendar Juggling Note – The Crookshank murals were finished on Monday, July 13, with a protective sealant applied the next day. Another run to Orlando to work on the sea turtle statue and a day spent on a rush art assignment that came in. 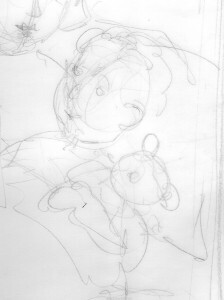 Oh, and the final “Fur & Feathers” pencil roughs were mailed this week as well! So i was adding up our receipts yesterday for tax purposes (rather then writing cover letters or hunting for prospective portfolio promotion and work opportunities, which i probably should have been doing – given the nature of this entry, but i so much prefer doing work rather than looking for it) and i was dismayed to discover – upon tabulating my W2 and freelance invoices – that i hadn’t made nearly as much money last year as i thought i had. And trust me, i didn’t think i’d made all that much to begin with. My regular, steady-income, wages didn’t particularly surprise me (tho in my dreams i did imagine the total annual salary to have been a tad higher) but on top of that i had also painted three murals, illustrated a new children’s book, worked for a couple local graphic designers, made a few speaking engagements, had some book signings, and introduced my first, brand new web site last year – so i just assumed all that would have contributed significantly to the coffers. Sadly, not so much. Math doesn’t lie and when i eventually factor in all my out-going expenses (an activity too depressing to contemplate because i already have a rough idea of the figure) i’ll probably barely have broken even. My first reaction was stunned pain, followed by that tightening of the throat and burning of the eyes that suggest tears at any moment, and then i realized – with not a little embarrassment – Oh My God… I Am A Stereotype! The quintessential Starving Artist (sans the “starving” part). All i need now is a seedy garret, a paint-splattered smock, a ratty beret, and a manic, half-crazed, wine-fueled demeanor and the image would be complete (i’d add a mustache, but that obviously takes the analogy too far, tho i suppose i could include a Kahlo brow). I have been doing this – art/drawing – professionally, in some form or another, for 31 years and still i’m barely making a living at it. I was pretty upset about my financial revelation all night despite my husband’s well-meaning attempts to cheer me up (“You don’t have to work you know, I’ll never let you down” and “Well you know artists never make money ’til after they’re dead”) and i’m obviously still attempting to work through my own little personal “Seldon Crisis” today [NOTE: Seldon Crisis, from Isaac Asimov’s “Foundation” books] thus the turn to writing, my own little self-help therapy session, the place i go to vent and exorcise all my emotional demons and creative angst. Sure, i probably should have hopped up this morning and started making those Cold Calls i’ve been putting off (since last year!!) which might generate some income, or started on the penguin canvas i have to paint, which will – but my brain wouldn’t stop buzzing with all the conflicting thoughts about what it is i do, coupled with the inevitable self-flagellating anxiety that i’m a dismal failure, and the fact that i so easily seem to typify the Artist cliche. The computer called and while, ordinarily, i would have banged out a private journal entry articulating all my disappointment, fears, and navel-gazing analysis it dawned on me that the Blog might be just as good a place for some rambling free expression. It is supposed to be – after all – the place where i describe the psychological gymnastics (the mental masturbation if you will) of my art process so what better venue to describe a typical emotional, self-doubt meltdown. Rather than a story inside the illustration, we’ll have a story inside the illustrator. I guess the immediate issue is the age-old conflict between Art and Commerce. Art for art’s sake vs art for income. Pleasing yourself and being true to your Creative Muse while still paying the bills. Part of me sincerely pictures myself living simply, that garret actually holds some appeal, BUT i’d also like it to be relatively free of vermin, large enough to work and live comfortably in, filled with all my books and my collection of Star Wars and Dr. Who toys, be in a charming little eclectic neighborhood, decorated with tastefully quirky flea market finds, and possessing the prerequisite satellite TV and wifi Internet access. And i want to be able to travel. And see our daughter safely though college and comfortably on her own independent path. And… and… and…. it’s the “ands” that get me every time. AND… tho i have only just scratched the surface of my internal musing i realize the morning has slipped away (as so often happens when i start pecking away at the computer. I’ve been writing, and deleting, for hours) and i’m rambling. Somewhere in here i lost the initial train of thought and realized there is such a labyrinth of concepts and ideas still to explore it would be better served to turn this into a series of entries so i’ll bring this particular chapter to a close before i complete lose whatever audience has stumbled in (with my profound appreciation by the way, if you’ve slogged all the way to this point). The writing did it’s trick and i feel tons better – plus my Short Attention Span Theater tendencies have kicked in – as, to be honest, has guilt about not working. As Stephen DeStaerbler said (or wrote, i found the quote in a book) – “Artists don’t get down to work until the pain of working is exceeded by the pain of not working.” Time to make the donuts!